Open or close your garage door without using a remote control or key. The Liftmaster 877MAX Wireless Keypad Keyless Entry System can open the door using a private 4-digit code you program directly into the unit. You can also program it with temporary access codes for visitors or delivery and service personnel so they can gain access to your garage without having to give them your personal code. Plus, it works with all LiftMaster® garage door openers manufactured since January 1993. Security+2.0 and Security+® rolling code technology assures a new code is sent every time the keypad is used and virtually eliminates interference. Compatible with all LiftMaster® garage door openers manufactured since January 1993. 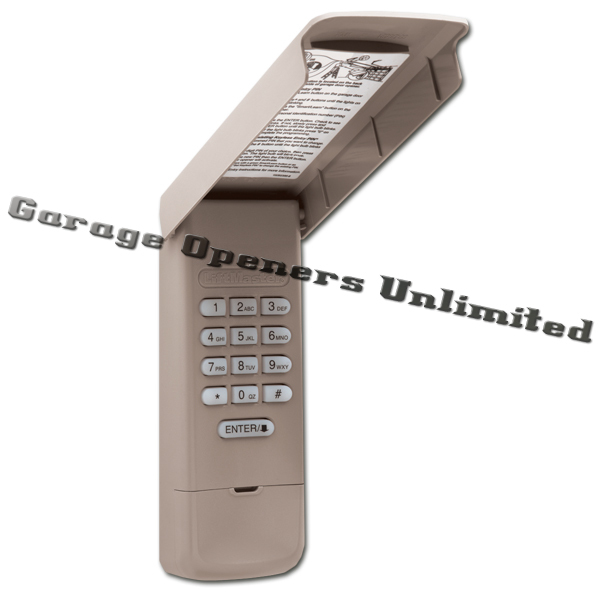 Compatible with 315 MHz or 390 MHz garage door openers manufactured after January 1, 1993. Make sure the garage door opener has a working light bulb because it is a programming indicator. For use with commercial door operators or other products that are 315 MHz or 390 MHz and have a Learn button. Refer to your product manual for the location of the Learn button. opener has a working light bulb because it is a programming indicator. Install the battery and program the Keyless Entry prior to installation. number of door openings. The temporary PIN cannot be the same as any previously programmed PIN. NOTE: This feature is not available on garage door openers that have a green Learn button or an external receiver. The garage door opener activates when the PIN and ENTER button are pressed. The keypad will blink for 15 seconds, during that time the ENTER button can be used to stop, start or reverse the door. If the wrong number is accidentally pressed, press the correct PIN then the ENTER button. The Keyless Entry will transmit only the last four digits that were pressed before the ENTER button. ONE BUTTON CLOSE: The Liftmaster 877MAX Wireless Keypad Keyless Entry has a feature that allows the door to be closed using the ENTER button instead of a PIN. NOTE: This feature is not available on garage door openers manufactured prior to 2006 or an external receiver. I am very happy with this product. It was easy to install, and it works great.